Hi folks! Brent here. 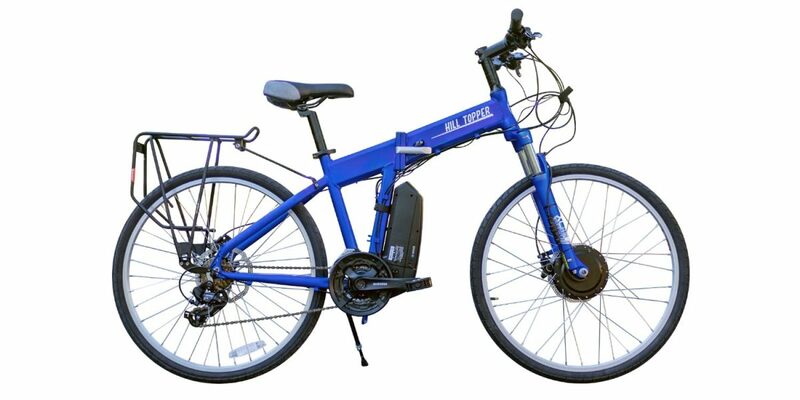 The Folder MTB from Hill Topper is an affordably priced kit electric bike that also includes a frame and all the other dressings to get you up and riding once everything is assembled. 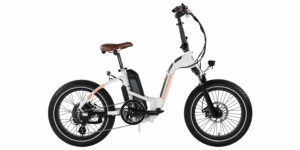 The model I received is priced at $1,399, but Hill Topper also offers several other version at lower price points, including the Sprinter for $1,099, the Commuter for $1,199 and the Ranger $1,299. Basically, each tier that drops down from the top model reviewed here has a bit less watt hours in the battery and less powerful motor. 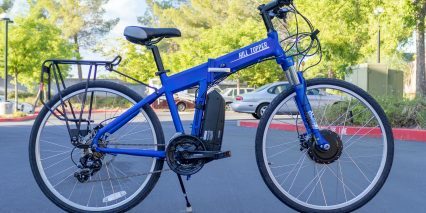 It’s great that Hill Topper has a few different options here for those who may not need a 350 watt motor and 396 watt hour battery, but this electric bike does only come in one frame size and one color: 16 inches and matte blue, respectively. 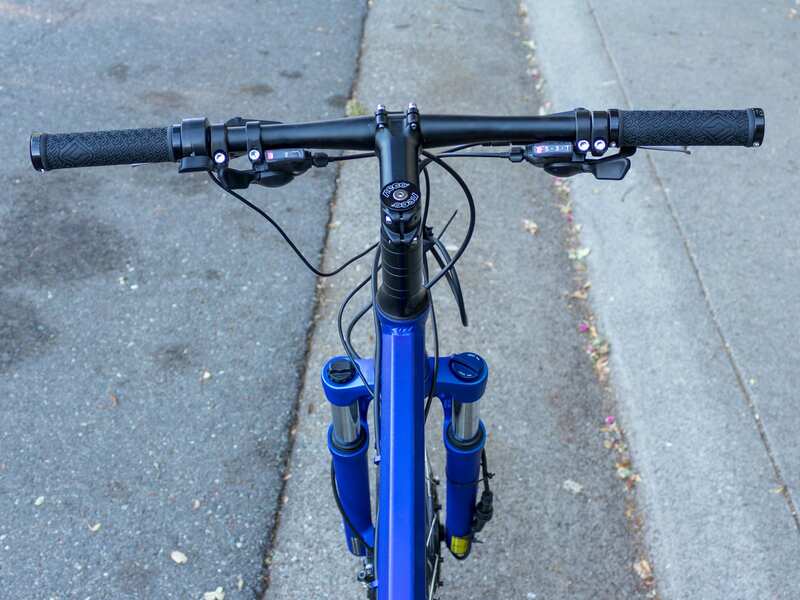 This is going to limit a bit who can ride this bike comfortably, especially since this one doesn’t have an adjustable angle stem like the City Ultra, which we reviewed recently here. That being said, the Folder MTB does still have it’s perks. First of all, the price point of $1,399 is definitely within the “affordable” category, which is great. 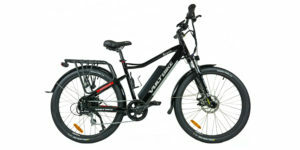 It also comes stock with plastic fenders and a rear rack, 180 mm hydraulic disc brakes and a really wide gearing range with 21 speeds. 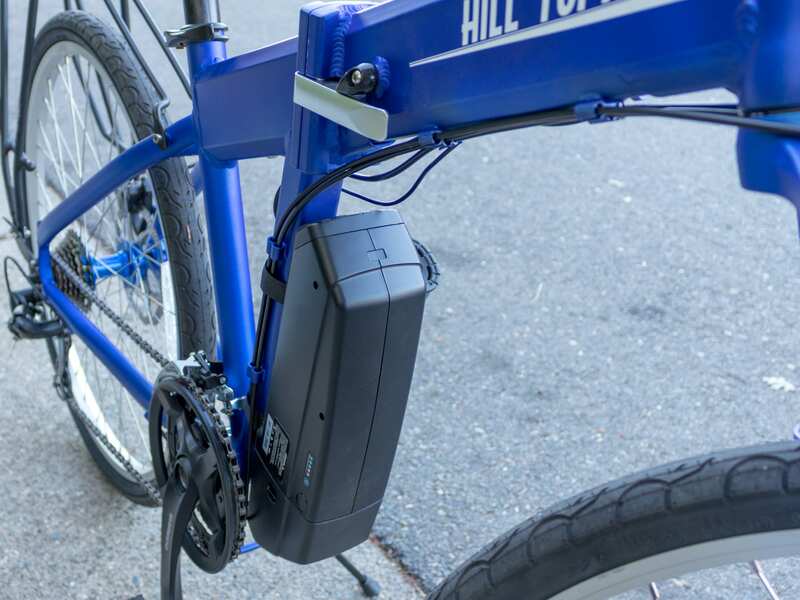 Hill Topper started back in 2008 as a kit electric bike company and it wasn’t until 2017 that they started selling full electric bikes. So the good news about that is for those who can’t fit this bike, or who don’t like the color, there’s always the option of picking out the exact frame and color you want from a different company and then just grabbing the kit from Hill Topper and swapping out the front wheel. Still, there’s always the risk that the components might not fit exactly right, and sometimes it’s just easier to purchase everything at one place. Hill Topper has about 50 dealers around the U.S., but most of their sales still come from online (like pretty much everything else nowadays I suppose). This means that for those who live nearby one of their dealers, or for those of you willing to travel, the option exists to try one of these bikes before you buy. But since there’s only about 50 dealers, that probably counts out most of us. So, while Hill Topper isn’t a direct-order only company, there’s still going to be a lot of similarities, with a few key differences. First and foremost, buying one of these bikes online means the recipient will have to assemble it themselves. And it should be noted that these bikes do take quite a bit to get together. So much so that I would advise considering seeing if a local shop could help out. 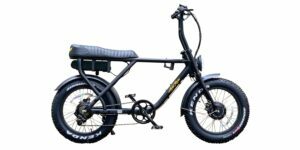 I’ll get into more detail about assembly here in a moment, but the second thing that can come along with a mostly-online electric bike company is a bit of a communication barrier. With Hill Topper that was not the case at all. The customer service was kind and helpful and I was able to talk with a real live human being each time I called (sometime from different numbers just to test). 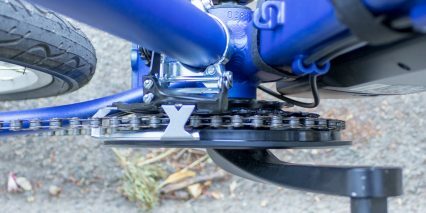 I think this is quite important for anyone who has specific questions about the Folder MTB (or City Ultra or kit) before buying, especially if a dealer isn’t nearby. The biggest pro though to direct order only or mostly-online companies like this is going to be the price point. Generally speaking, there’s going to be some savings here and Hill Topper fits that mold as well. One last cool thing about the company before I dive into the assembly process is that their main shop is located in Seattle, Washington and they assemble the majority of their components in-house. Sweet! Ok, so let’s talk about getting this bike put together. 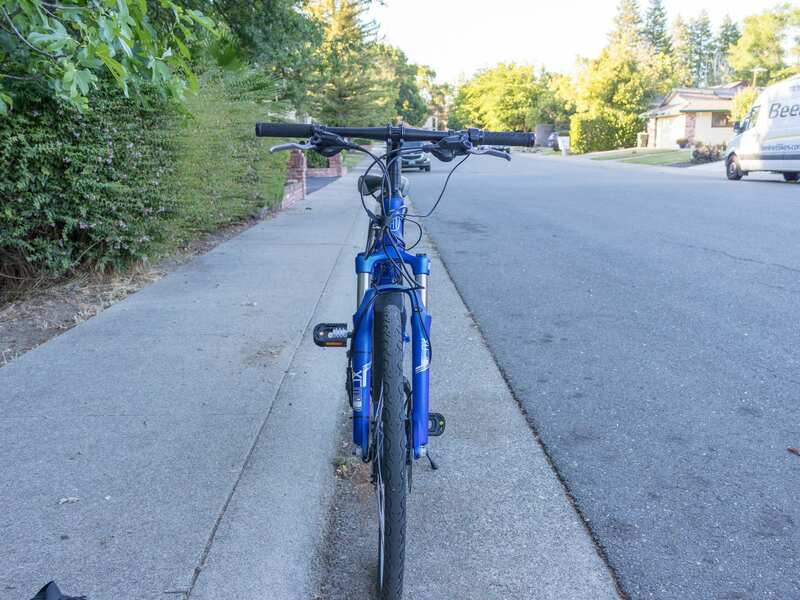 I had a lot of difficulty with the first bike from Hill Topper, the City Ultra, but learned a lot along the way and want to share what I learned in the hopes that it will save you some time and possibly frustration. 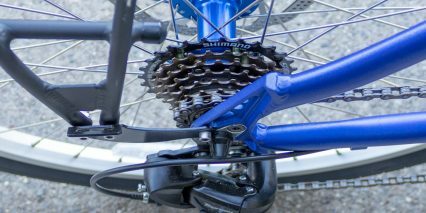 I recommend assembling the Folder MTB as follows… start by putting on the handlebars and inserting the saddle. Then, flip it over and carefully (so it doesn’t get scratched) rest it on the saddle and handlebars. From there, let’s get the front wheel on. There’s a series of washers on the axle that go between the nut and the dropouts. On the righthand side there’s a total of four washers. I had to remove the one closest to the motor (it’s the thinnest washer of them all) in order to get the axle to fit into the dropouts. At this point, the washer closest to the motor should be the thick one with the angled piece that juts out at a 90º angle to form an L-shape. This washer needs to towards the inside of the dropout and the wheel must be rotated until that washer aligns with the dropout so that it will slide into place. I really hope that makes sense because it did take me a minute to figure out why everything wasn’t fitting, but I will also visually show this in the video review, so please check that out if you still have questions about this. 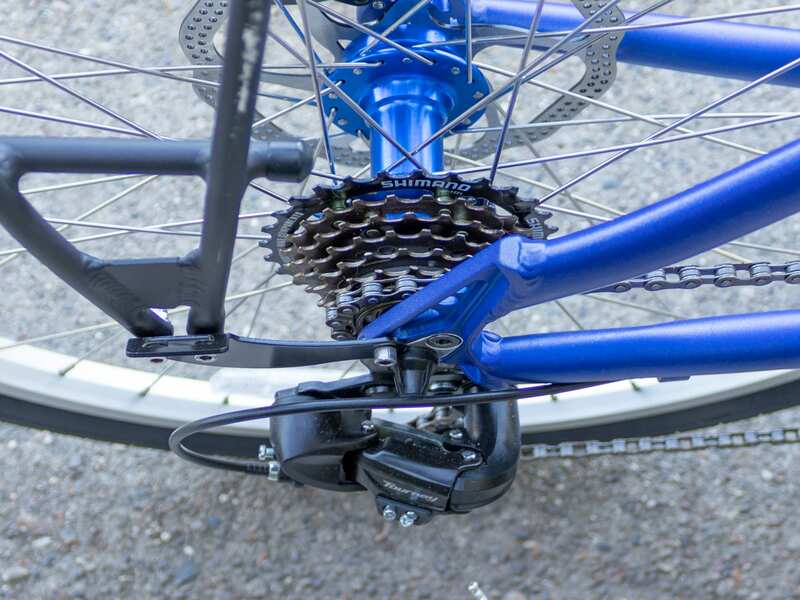 With the front wheel on, flip the bike back over and deploy the kickstand. Now onto the battery bracket… Use the included key to unlock and remove the battery from the bracket and controller. There will be three screws inserted into the downtube (for lack of a better word… it’s more like a big gusset). Remove these screws and throw them away. DON’T USE THESE SCREWS! These screws have a round head and will not allow for the battery to lock onto the mounting bracket. Instead, take the two shorter flat head screws (they are in a separate baggy with two other longer flat head screws and some washers) and use those to mount the battery bracket with the controller pointing towards the floor. There are three holes to mount the battery, but unfortunately there are only two flat head screws that will fit. Furthermore, two of the bosses didn’t seem to be properly drilled and I was unable to fully screw in the flat head screws into those holes, so on the model I received I have only one screw holding the battery bracket in place. Still, it seems be holding up okay after a few miles. The only other piece of assembly that I found a bit tricky was getting the throttle on. The throttle here is a single piece and must be slid on the handlebars. I chose to place the throttle on the left but it could be placed on either side as they are mirror images of each other. 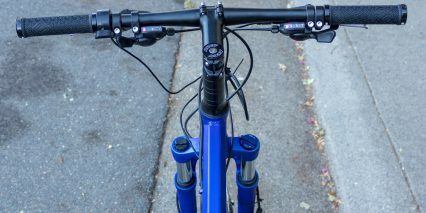 To get the throttle on, unscrew the shifter until it is loose enough to be slid towards the center of the handlebars. Then unscrew the brake lever housing and slide that over to the middle of the handlebars. Then unscrew the lockers on the grip and remove them from the handlebars. With that off, I slid the throttle on and then reinstalled the grip and lockers and tightened those up. Then I slid the brake lever housing back over and tightened that up. Lastly, I spaced the shifter about an inch away from the brake lever housing and tightened that up. This formation allows for enough room for the triggers to move, while still keeping the throttle close enough to my thumb to prevent too much strain when using it. After all this I needed to adjust the front disc brake as it was pretty far askew from center. To do this I loosened the two screws that secure the brake assembly to the forks and recentered it, then tightened those back up. The last point I want to make about assembly is the fenders that come with this model are secured via zip-ties, which I used to snug up the power cable and throttle cable to the frame, so I was unable to attach these. Whew! Ok that was a long bit but hopefully you find it helpful. Onward to the specs! Driving this bike to a top throttle only speed of 20 mph is a Hill Topper branded Bafang 350 watt geared hub motor with 45 Newton meters of torque. At 350 watts, this motor is definitely more a power sipper than a power house, which can be a good thing! This simply means it’s not going to drain my battery as fast compared to a higher wattage motor. But it still has enough zip to make a real difference when climbing hills… which is pretty sure why this company is called Hill Topper. 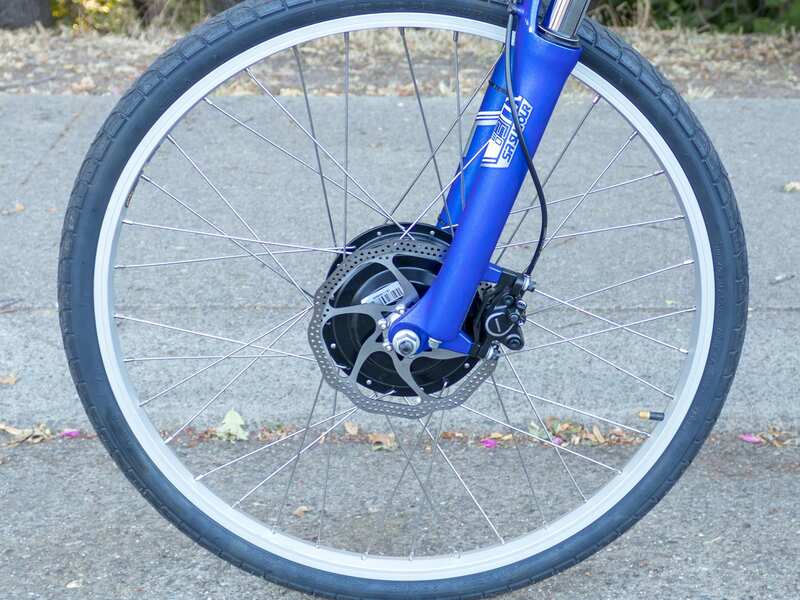 Having the motor in the front wheel makes installing it easier compared to if it were in the rear wheel with the derailleur, but it also means the extra 7.28 pounds can is quite noticeable when steering. 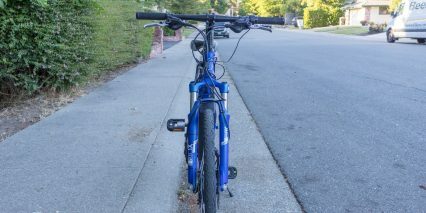 Basically it just doesn’t feel quite as nimble as a mid-drive or rear hub motor electric bike. It also means I get a little bit of wheel slip when on loose terrain like dirt and gravel. 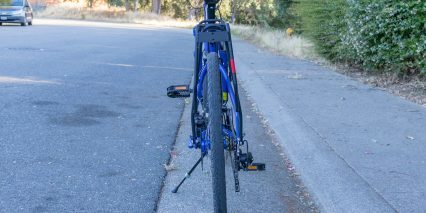 I didn’t notice this on the City Ultra (although I didn’t take that one off road at all), but I see it with the Folder MTB probably because of the smaller wheel diameter of 26 inches. This gives the motor a better mechanical advantage (smaller wheels are better for this) but that extra bit of torque is adding to some wheel slip I think. Again, this is a throttle only electric bike and the only way to unleash the power here is with the throttle. Thankfully, it’s a variable speed throttle so it was pretty easy for me to set a precise speed. 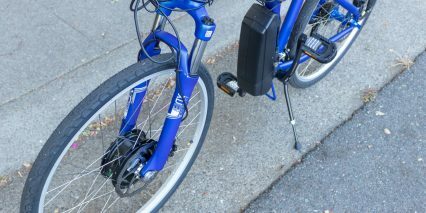 Powering the Folder MTB 36 volt 396 watt hour Lithium-ion battery that attaches to the downtube. This bike has three chainrings and seven gears in the rear cassette for a total of 21 gears, which is great for those who are looking for a wide spread, but I found it be overkill. 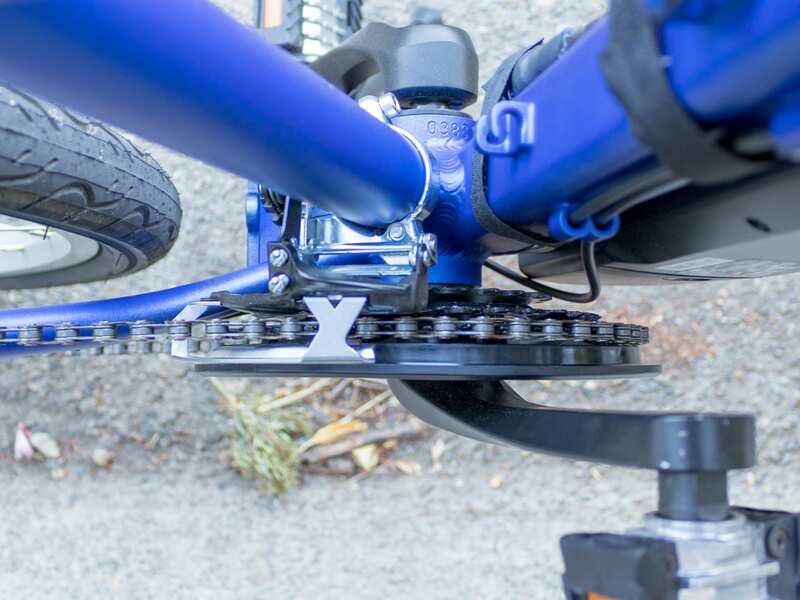 Most electric bikes, even the higher end mountain bikes, only have one chainring, and very rarely two, but Court and I were talking about it and we’ve never seen three chainrings on an electric bike. And I think there’s a reason for that. It adds unnecessary complexity and weight! 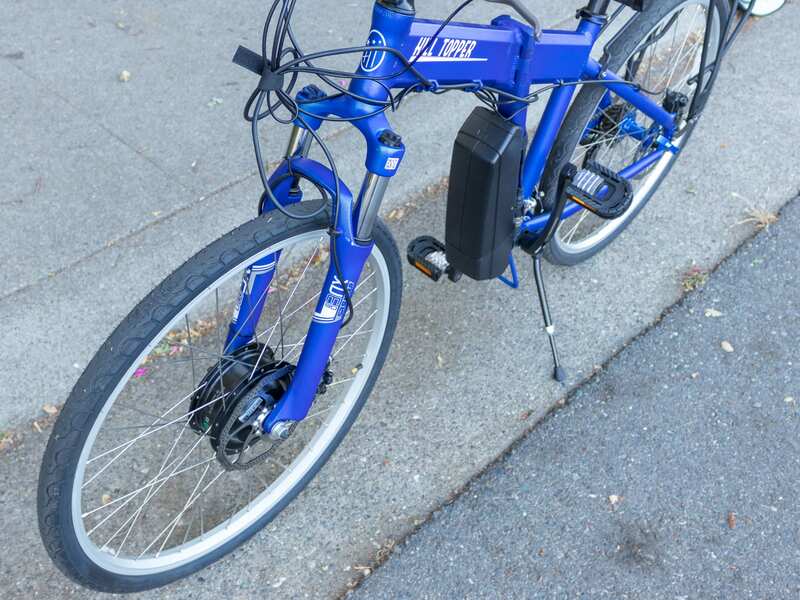 Since this electric bike has a 350 watt motor, the extra gears just aren’t needed since the motor fills in the gaps. 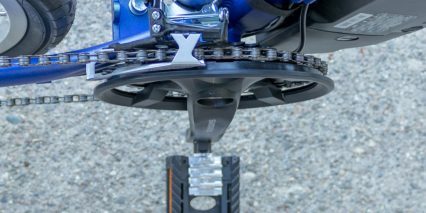 Again, great for those looking for a wide spread, maybe for those who really want to minimize motor use, and the chainring derailleur does act as a chain guide so that’s definitely a positive attribute. Still, for my test rides I just used the middle chainring and then switched through the gears in the rear cassette. 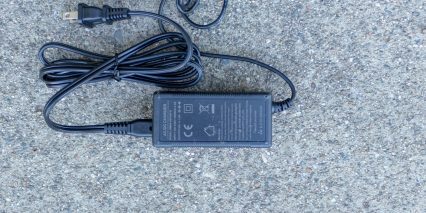 The battery here does only power the motor since there is no display, and it is locking and can be removed. 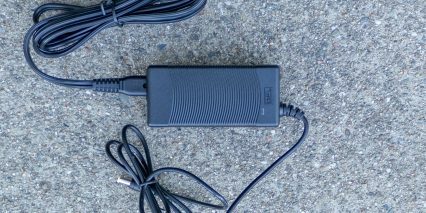 This is good for those who might be limited on space and/or want to charge the battery separately from the bike. With the position of the battery though, the key and charing port are pretty much in the direct line of fire of the cranks, so I made sure to remove the key as soon as I was done unlocking the battery since rotating the cranks could potentially sheer it right off. 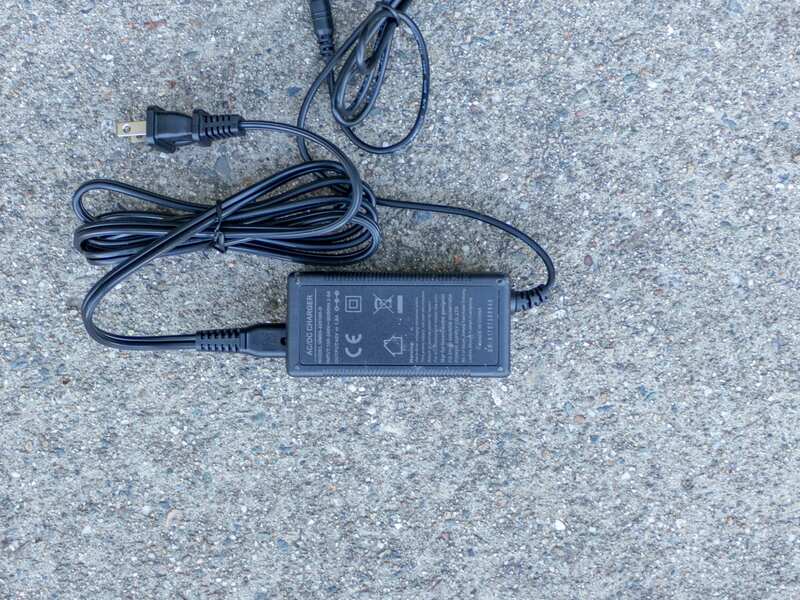 Same thing goes for the power cord. Again, since there is no display with the Folder MTB, the only way to tell how much juice is left in the battery is to check the LED power indicator on the right side of the battery itself. It’s a five tick battery indicator with 20 percent increments, so not super precise. 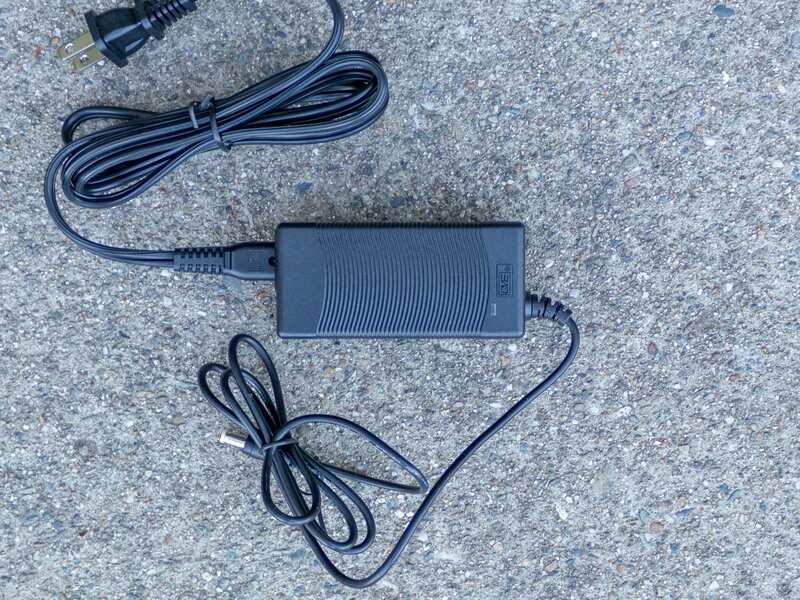 Another note about this battery is that there doesn’t seem to be an auto shutoff feature, so again, I made certain to turn the battery off once I was done with my ride so it didn’t slowly drain away into the ether… or wherever unused electricity goes. Lastly, the simplicity of this bike means there are no motor inhibitors. This is a pretty big safety concern for me, especially with an electric bike that has a throttle, since I might accidentally keep the throttle depressed in an emergency situation, resulting in a longer stopping distance. I actually noticed myself using the brakes and throttle at the same time a few times since I’m so used to motor inhibitors. So just something to be mindful of here. Overall, the Folder MTB is labeled as a mountain bike, but I think that’s a bit of a misnomer here. 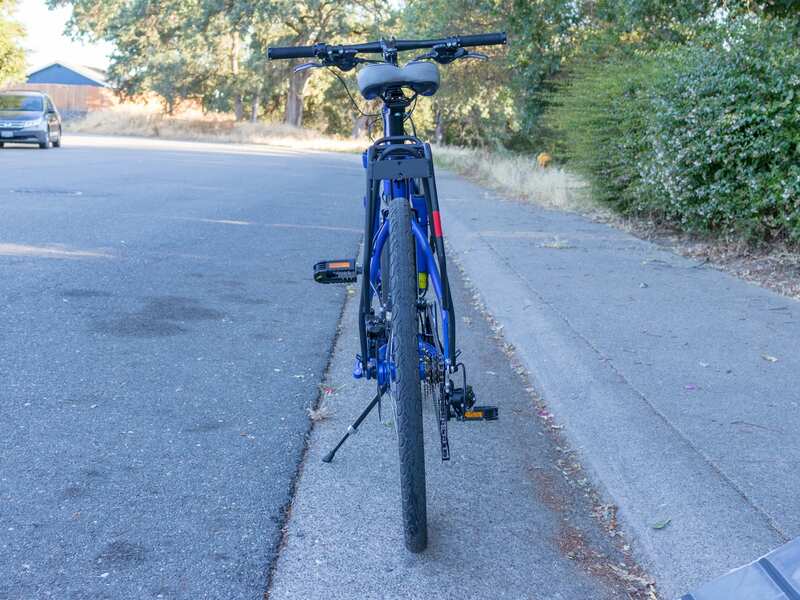 While it does have front suspension, the 26 inch by 1.5 inch tires are pretty narrow and they didn’t perform very well for me on the gravelly terrain I tackled. 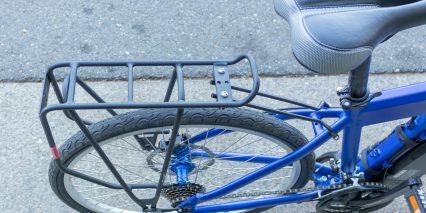 Furthermore, the folding frame is compromised structurally compared a traditional frame, and doesn’t feel well suited to any real off road use besides maybe a hard, dirt trail, especially since the locking mechanism on the frame only has a small plastic piece that slides over the latch, which still allows for the latch to come partially loose. 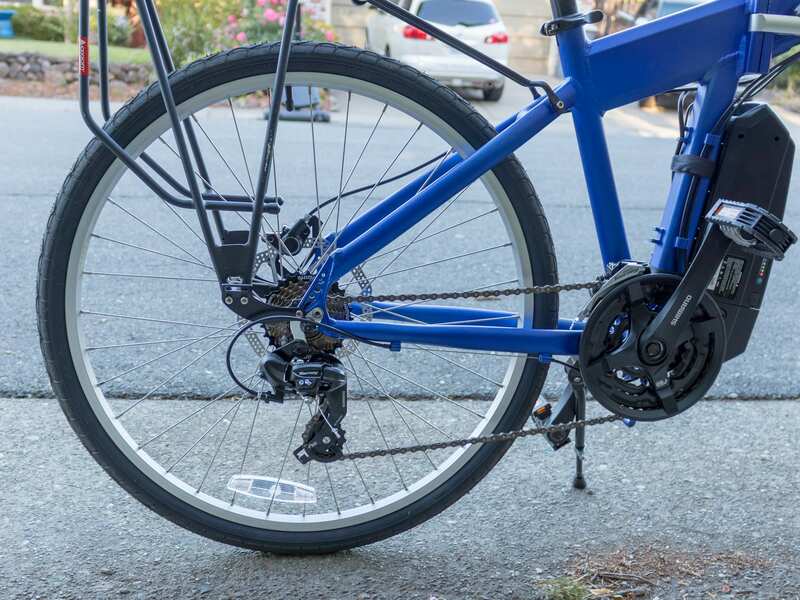 I do like that this bike comes with front suspension, a rear rack and fenders, and I really like the option to pick and choose which battery and motor pairing works best (which can also reduce the price by a couple hundred bucks). 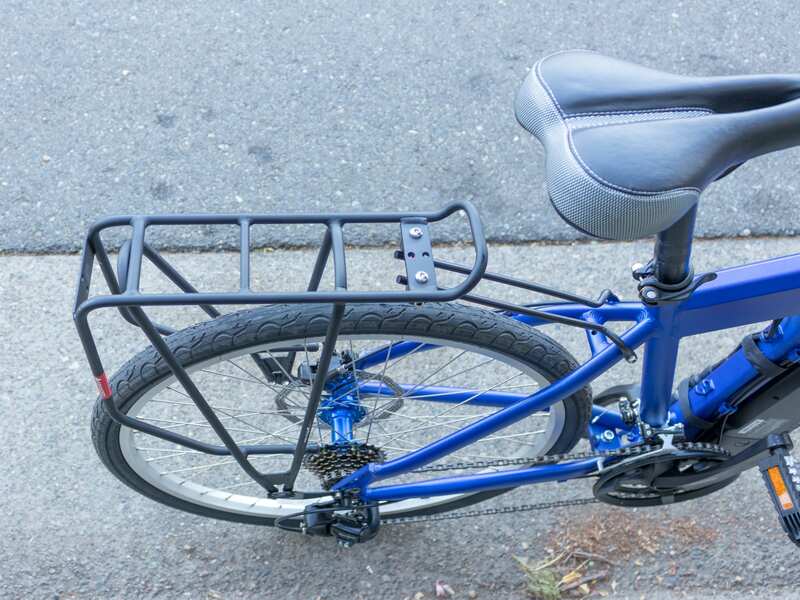 It’s great that this bike does fold in half, and this might work very well for those who have an SUV but maybe not a bike rack, so you can throw it right in the back. But I should note the folded dimensions are practically the same save for the length, which is cut about in half. And again, the single frame size and color will certainly limit who can comfortably ride this bike, and those who find the color attractive, but thankfully Hill Topper sells their kits separately. 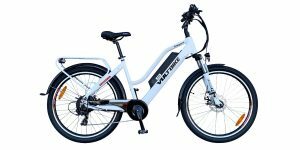 I think this is a great choice for those who fit this frame and are looking for an affordable electric bike that can fit into tight spaces. 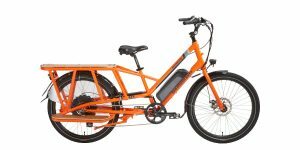 I think the Folder MTB would work great for cruising through the city or neighborhood and maybe even the occasional dirt trail. I want to thank Hill Topper for partnering with me on this review and please hit me up with any questions and I’ll do my best to answer them! Have and ride safe, folks. Thanks for the review Brent, sorry you had to ride with a bent wheel. 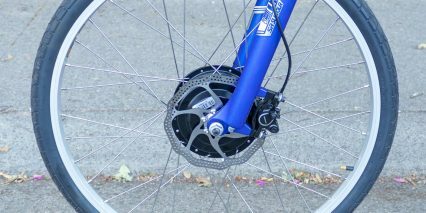 I had a good experience with Clean Republic’s customer service they accepted a return without question, I tried their 24v kit motor wheel but it could not pull my 220lb weight up hills. I like that they offer a more powerful 36v system and your ride video helped to show how it performs. I found the Hill Topper wheel was easy to install though it had only a keyed anti-rotation washer and no torque arm so I would only suggest fitting it to a steel fork. 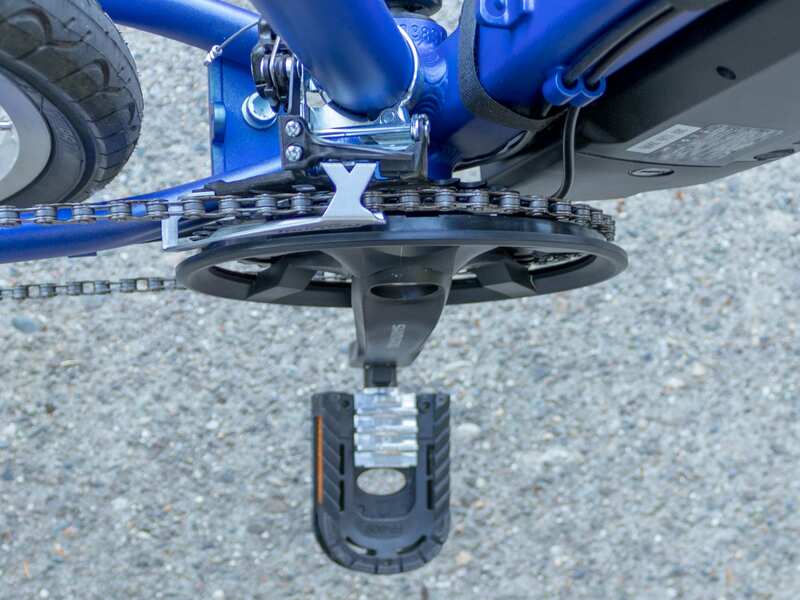 I wish they offered pedal assist because pushing a throttle gets tiring after a while but it’s OK if you have a lightweight bicycle you don’t mind pedaling and just want to use the motor to get you going and provide a push when riding up hills. Hill Topper? 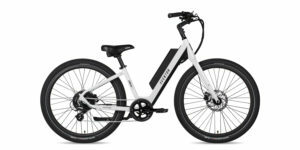 I understand the value-focused customers this ebike is targeting but that is just not a good sounding model name. 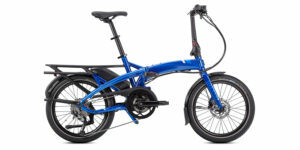 Seems to me that the folding aspect of full sized eBikes really doesn’t reduce footprint so I question the merits of slicing the frame structure to enable that capability but maybe there is a market for a full sized folding bike. You guys are still doing a great job pumping out good reviews. Oops, I made a comment that implied Hill Topper was a bike model name when it’s actually a brand name. Still not a fan of that name but I understand that maybe it makes sense relative to the low price / value segment they are promoting their eBikes and kits to. Seems this segment is getting crowded quickly. 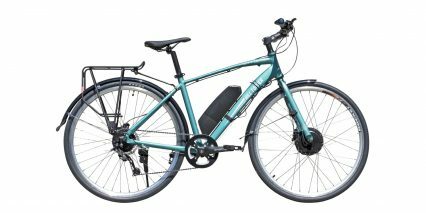 I really hope people that are considering an ebike purchase really decide they are committed to using the ebike frequently…such as getting out of their cars as much as possible for urban commuting. 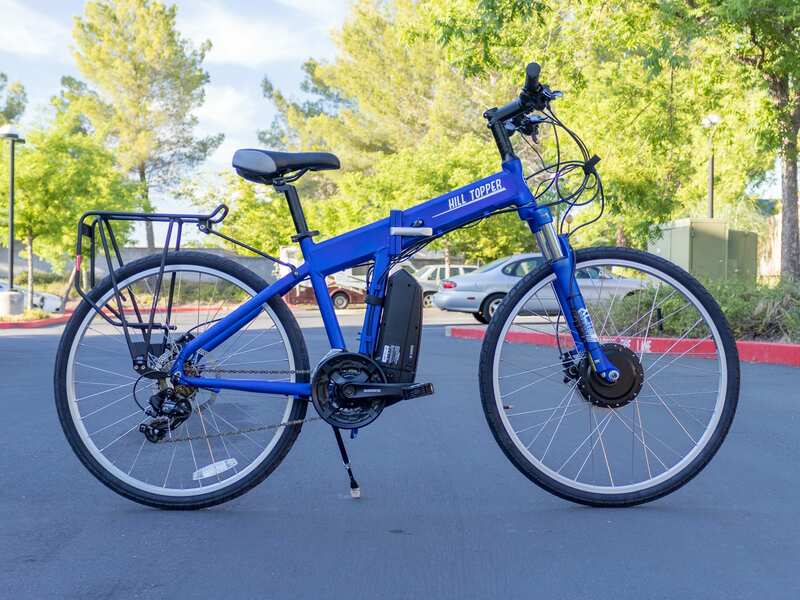 If you think about the ebike as a serious form of transportation the purchase decision becomes a lot clearer – sometime a higher quality product will be a lower cost of ownership long term. Not saying this bike is a bad product but I would not consider it something I would want to put more than a few hundred miles on a year. 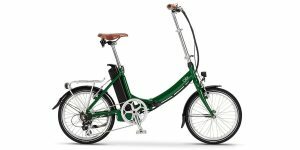 I’ve ridden my ebike almost 4,000 miles in the last year so I think people should think of the ebike as transportation, hot just a ride around the neighborhood product (keep your traditional bike for those rides). No- just no. 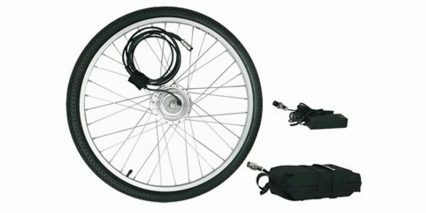 Good review, but if someone wants a folding bike this is not a good value. 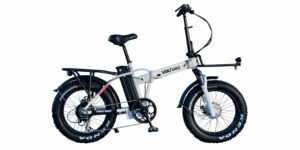 First of all, ask yourself why you need a folder, because these larger folding bikes are a pain (you have to remove the front wheel to fold it compactly) if you need to fold it frequently. If not, say you want to put it on a plane or a boat, get a used Montague instead. 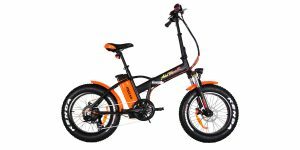 I have a Paratrooper Pro, and although it’s not the best of folders, it’s a far better base bike than this one overall. 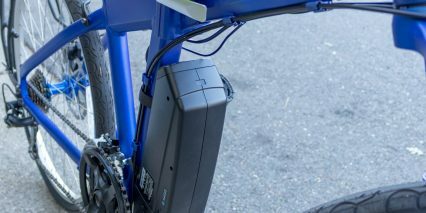 It’s also fairly easy to install a Bafang BBSHD on a Monty, and then you would have enough power to use it on dirt (but it will never be a trail bike.) 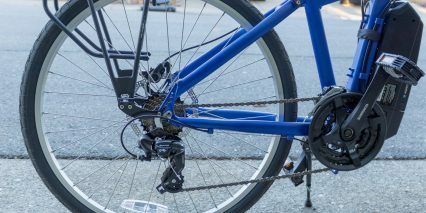 I have a BionX D500 on my rear hub, and let me tell you, my bike is NOT “nimble.” I can only imagine how much worse the ride of this throttle-only bike would be. Hehe, I wonder what it takes to smoke this motor- this reminds me of the Luna video where Eric rides a Walmart trike repeatedly up a hill to see what it takes to burn (I don’t remember the manufacturer) the front hub motor up. Don’t. There are better alternatives for $1,200. You might have to look around for a decent used bike and install your own kit, but don’t do this.